We thank you from our hearts to all of you who physically or spiritually accompany us on this day, when we hold in memory and justice our 45 sisters and brothers, and the 4 others not yet born, so they never are forgotten. We, the women and men of the Civil Society Organization Las Abejas from Acteal, together with the survivors and victims of the Acteal massacre, view with great sadness and indignation how the bad government of Mexico, represented by Enríque Peña Nieto, continues to violate Mexicans’ human rights in different ways. We see it all as a way to serve the neoliberal capitalist system, clearly demonstrated by the subordination to the government of the tyrannical and racist Donald Trump. These days a lot of things are happening, like the violation of human rights in Mexico as well as in the United States, and things like President Trump’s decision to deport immigrants living there. And another one of his decisions is the construction of a wall on the border between Mexico and the United States. We, as a pacifist organisation, condemn these policies which violate human rights, because no one is illegal in this world. We know that the United States and its racist government are the creators and perpetrators of many crimes committed in many countries throughout the world through their wars of invasion and dispossession in many places on planet earth. The United States is one of the heads of the capitalist monster that kills and destroys humanity and Mother Earth. We have to be alert and united in the face of the threats and latent aggression that the United States government, or those rich people sick with power and greed, make against us. The neoliberal capitalist system must be destroyed, because otherwise the greed and venom of this capitalist monster will kill us. It has no scruples and will stop at nothing to grab our lands and territories. We have seen how this killer monster – in the guise of the Bad Government, paramilitaries, the police, the federal army, the Marines, assassins hired by organised crime – murder women and men social justice fighters, the women and men of Coordinadora Nacional de Trabajadores de la Educación (CNTE as its known by its acronym in Spanish), migrants, young people, students, farmers, workers. This year, the Bad government and organized crime have intensified their harassment and murder of environmental activists, the women and men defenders of life and the territory. We refer to the recent murders of our brothers Juan Ontiveros Ramos and Isidro Baldenegro from the Rarámuri community in Chihuahua. They were killed by assassins with links to organised crime, but we also know that here in Mexico, corrupt politicians collude with the drug traffickers. Murders of environmental activists and defenders of life and the territory, don’t just happen in Chihuahua state, but in many parts of Mexico. We remember the murders of our compañeros Juan Vázquez Guzmán and Juan Carlos Gómez Silvano, both Adherents to the Sixth Declaration of the Lacandon Jungle from the San Sebastián Bachajón ejido in Chiapas. They gave their lives in defense of the land and territory, keeping it from the clutches of the transnational companies, with the complicity of the Bad Government in Chiapas and Mexico. As well the murder of our compañero Mariano Abarca in Chicomuselo, Chiapas who was also murdered for defending life and the territory against an Canadian mining company. And the capitalist monster doesn’t only kill in Mexio, but also kills environmental activists and defenders of the life and the territory in other parts of the Americas, such as the case of our compañera Berta Cáceres, from the Lenca community in Honduras. For opposing the construction of a dam that they were going to build in her community, she was murdered. And we could continue with an endless list of compañeras and compañeros who have been murdered for fighting against the capitalist system devouring Mother Earth. So we see the objective of the capitalist system, or whoever is rich and sick with power and greed, is to take over of our lands and territory. Their objective is to plunder Mother Earth’s wealth, such as water, gold, silver, petroleum, wood, animals and other resources. If we make a brief analysis of the history of the looting and plunder of our lands and territories since the Spanish invasion, we realize that this history is being repeated these days, only that the current invasion and dispossession are more modern, and more cynical. This time they do it “legally” through structural reforms and, with more sophisticated weapons, which they use against those who oppose us this looting and dispossession: spoils. So, as we confront this barbaric policy, we think that it is urgent to stop this criminal capitalist system. We reinforce our struggles, our organizations, our movements to defend our forests, rivers, lakes, sacred hills, territories and our own lives. Although the capitalist monster and the rich people sick on power and greed may have a lot of money and weapons, but there are also a lot of communities and while we may not have sophisticated weaponry, we have something much more powerful than the rich will ever have: dignity, organisation and collectivity. This collectivity and organisation are in a lot of movements, and organisations, such as the National Indigenous Congress, the Pueblo Creyente from the Diocese of San Cristóbal de Las Casas, the Parish of Simojovel (as Pueblo Creyente), the Movement in Defense of Life and the Territory (MODEVITE as its known by its Spanish acronym), the CNTE (Education Workers Union), student movements, conscious women and men academics, intellectuals, scientists, farmers, workers, religious men and women, feminists and many other sectors of society. Sisters and brothers, we stress that the struggle and the defense of Mother Earth is indispensable. The earth is the source of our existence on this planet, it gives us everything, so the rich people sick with power and greed want to take possession of it. So between Mother Earth and women and men there must be balance and mutual respect. Let us be clear: we are the guardians of Mother Earth and we have an obligation to care for and defend it. Sisters and brothers, the struggle and defense of life and Mother Earth has no timetable or expiration date. It is all the time. Let us always be alert and aware so that we are not distracted by Bad Government with its policies of deception and death. Fraternity, unity and solidarity are the basis of our strength and ways to do away with the capitalist monster. And one of the paths that can be seen on the horizon is the proposal from the National Indigenous Congress to appoint an independent indigenous candidate for President of our country in 2018. Only then can we live free in harmony with Mother Earth, and together with all the women and men in Mexico and on our planet. For now, that’s all we have to say, and we anticipate that the compañeras from the Civil Society Organization Las Abejas from Acteal will soon send a call-out for an action which will take place next March 8th. This important event is organised to mark International Women’s Day and will raise awareness and denounce all types of violence suffered by women. Because for a fair and dignified Mexico, there should be no discrimination, no violence against women and no more femicides. Stop the femicides in Chiapas and Mexico! No more murders of men and women environmental activists! Punishment for the intellectual authors of the Acteal massacre: Ernesto Zedillo, Emilio Chuayfet, General Enríque Cervantes, General Mario Renán Castillo, Julio César Ruiz Ferro and their accomplices! Justice for the 43 students from Ayotzinapa! Total rejection of the rise in petrol prices! Total rejection of the tyrannical and racist Donald Trump and his wall! The second chamber of the Supreme Court of Justice (SCJ) denied an injunction requested by two people implicated in the murder of 45 people in Acteal, municipality of Chenalhó, Chiapas, on 22 September 1997. This occurred although it was the first chamber of the same Supreme Court which ordered their release in November 2014 for violation of due process (having been sentenced based on evidence obtained illegally). 60 others indicted on the same charges were also released for the same reason in different processes. The ministers considered that the Attorney General of the Republic’s Office (PGR) should not indemnify those accused of homicide, serious injury and criminal association as well as unlawful possession of a firearm for exclusive use by the Army; and originally sentenced to 36 years in prison for participating in the massacre. The Minister considered that, “regardless of the decisions that federal judges reach, regarding the innocence or guilt of the accused, it cannot be attributed to the PGR that it incurred in an irregular or abnormal administrative activity” as “it is enough that the Federal Public Ministry has fulfilled [its duty] in providing the existence of the corpus delicti and probable criminal responsibility”. Collection during the displacement of Colonia Puebla in 2013. Photo: @Koman Ilel. On May 26, a group of 14 families from Las Abejas de Acteal Civil Society, residents of Colonia Puebla, Chenalho municipality, Chiapas, were displaced fleeing the violence caused by the conflict after the elections in that municipality. The displacement happened after violent incidents between sympathizers of the recently dismissed mayor, Rosa Perez Perez of the Green Ecologist Party of Mexico (PVEM), and supporters of the new mayor, Miguel Santiz Alvarez, causing the death of two people, one of them a minor, who died from a bullet wound. The Chenalho Pedrano Movement, opponents of Perez Perez, said in a statement that they were attacked with“firearms, sticks, stones and machetes, in an ambush that was orchestrated by sympathizers of the ex-mayor.” Furthermore, there were“two houses burned, two destroyed, three vehicles destroyed and six people wounded”, according to the statement from Las Abejas. Las Abejas noted that “until now, there are no conditions to return”, so that the displaced are currently in the headquarters of the organization. In another letter they outlined that, “the displaced from the colony are living through suffering. Therefore we ask you the favour of helping with supplies.”To this end, they have opened two collection centers for clothes in San Cristobal de Las Casas and they ask for financial support to be deposited in a bank account. According to La Jornada, the National Commission for Human Rights (CNDH) “requested the government of Chiapas to apply cautionary measures and guarantee the rights of the people who have been displaced.” The measures are aimed at guaranteeing rights to food, health, a home, physical integrity and the lives of the displaced. It is worth noting that the disagreement following the result of the municipal elections in Chenalho, with the victory of PVEM, gave rise to the Chenalho Pedrano Movement in rejection of the elected mayor, accusing her of “corruption, abuse of power and diverting resources.” This group organized a takeover of the town hall and a number of government offices, it took over the State Congress for some hours, and it kidnapped three civil servants who were negotiating a solution to the disagreement, among them the President of the State Congress and a deputy. Having put them on public show, one dressed as a woman, Congress accepted the resignation of the mayor. It is also worth mentioning that 17 families of Colonia Puebla were displaced by in August 2013 in the conflict between Catholics and Evangelicals in dispute over the land where Catholic hermitage was located. Almost 100 displaced people returned after eight months off their lands, denouncing the lack of law enforcement for their aggressors. What is happening in Chenalhó (I use the present because the fire has not been put out) must be examined beyond the obvious dimension of post-electoral conflicts or of the undeniable but partial component of gender. To get to the bottom of the issue it is necessary to go back in history to something that is not about this moment nor exclusive to Chiapas, but that, nevertheless, is the deep root of what happens here and now. The big lesson of the last century for the Mexican political class was that in order to maintain themselves in power it was necessary to make concessions to the people; not isolated and circumstantial, but rather, so to speak, of a permanent and structural character. That was the social policy of the “governments that emanated from the revolution,” which permitted the PRI to stay in power for 70 uninterrupted years of relative social stability. We all know of course the vices that accompanied and corrupted this social policy: a lack of democracy, paternalism, corporatism, electoral patronage, application of an economic model that was incompatible with those demands, corruption, etcetera. The system had its clear limits and anyone who would attempt to exceed them would have to put up with the worst consequences (Tlatelolco is not forgotten). However, that social dimension was real and one of the proofs of that is the void that appears now that it is dismantling. The new generations of the political class formed in the rarified heights of neoliberalism, didn’t know or didn’t want to see the difference between social policy and the vices that were parasitic to it. They placed everything without distinction into the same bag, put the ambiguous label of “populism” on it and threw it in the rubbish. It is like the saying that they threw the baby out with the bathwater, but we could modify the image saying that in this case they threw out the baby and were left with the dirty water, because the social and nationalist policies have gone away, but the corruption, vote buying and lack of democracy continue. For example, the button of the SNTE: what has been combatted is every attempt at political independence –including its independence from the teacher Elba Esther– what has been maintained is the absolute political, bureaucratic and electoral manipulation. Upon disavowing the great lesson of the 20th Century, to which it owed its stay in power, the new political class was sustained by just three props, rigid but not solid: media manipulation, colossal vote buying but in drips (in the end, vote buying on scales that reduce to insignificance the old practice of a sandwich and a soft drink) and brute force, with, as a last resort, the Army. In places like Chiapas, with high social marginalization and very incipient political awareness (lights that point in the opposite direction, like the work of the Diocese of San Cristóbal and the lightning of Zapatismo, should not prevent from seeing this sad generalized reality), the media manipulation assumes the tragic-comical characteristics of the daily exaltation of a governor in a permanent campaign, the vote buying with government supports and programmes has the subtle efficiency of a steamroller, and the Army and other forms of repression are always around the corner. One must add to this a fact that is more specific to Chiapas. It turns out that the governor and a sector of the political class that accompanies him, with an incredible blindness which is the product of excessive ambition for power (that hubris about which Javier Sicilia speaks so much, which inevitably brings about its nemesis) decided to jettison not only the social policies of the old PRI, but even the very cover and party name, ignoring the fact that, if there was anywhere it had taken root, and anywhere they had to thank for their stay in power, it was among the indigenous communities of Chiapas. They shook the hand of the Green Party, which was born to be on the stage with others, and they converted it into the centre of their political project. So, nothing more than their pistols imposed the Green candidates on communities with old PRI roots. Chenalhó is no more than the last in a long list: Chamula, San Andrés, Oxchuc, Chanal, Altamirano and many more. Practically all the post-electoral conflicts that have devastated Chiapas since last year’s elections are like this, the creation and exclusive responsibility of those who now suffer their consequences. 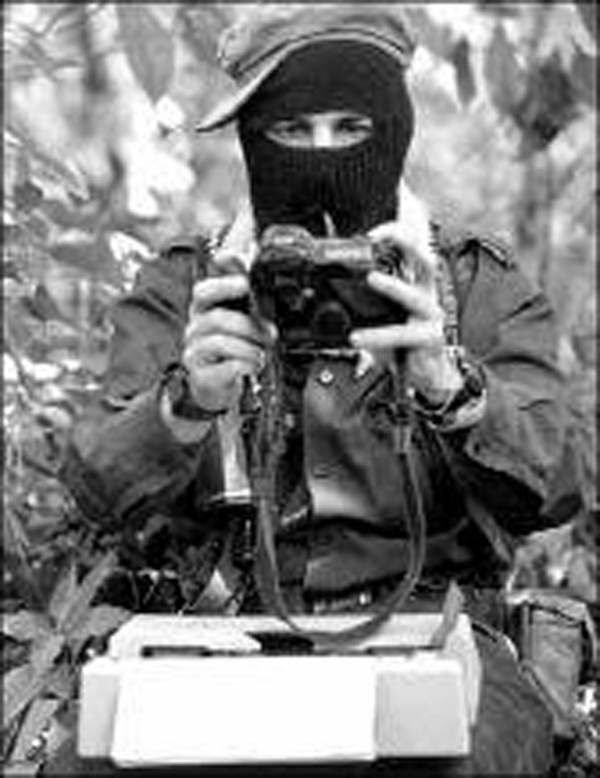 In the case of Chenalhó it is complicated by a combination with the survival of the paramilitaries responsible for the Acteal Massacre, but that merits a separate analysis. Division in the communities and destruction of the social fabric is now, unfortunately, an old and sad story in Chiapas, the fruit in good measure (although not exclusively) of the counterinsurgency plans for confronting the Zapatista insurgency. But with these actions, the political class has taken the division in to the heart of its own support bases and has given a new twist to the destruction of the social fabric. The confrontation in Chenalhó has nothing to do with the independent forces in the municipality, the Zapatistas, Las Abejas, not even with the relative opposition of the of so-called political parties. It is simply a matter of the old governing sectors, arbitrarily divided by their own state bosses into PRIístas and Greens, who are disputing the municipal budget booty, and that is all. But they are taking the whole municipality between the legs (not to speak of the old Secretary of Government and now leader of the Congress). Members of Las Abejas from Colonia Puebla are now displaced from their community again (for the third time since 1997) and two people, including a female minor, died there in the crossfire between PRIístas and Greens (for sure, neither the deaths nor the displaced angered the authorities as much as the teachers’ haircuts). Even the Zapatista communities, clearly outside and apart from all the party fights, feel worried by a violence that could be directed against them at any moment. At first sight this situation looks like a product of the blindness and incredible political insensitivity of the ruling class, rather than a deliberate plan to create greater destabilization; the fate of the leader of the (Chiapas) Congress, would seem to corroborate this: they have not even been able to protect themselves. But, who knows? Chiapas is the site and destination of important megaprojects and we know about the increasing pressures throughout Latin America to bring about transnational projects, whatever the cost. Fishermen gain from troubled waters. And what about the third prop? Will it be the Army like they claimed in Ayotzinapa, right there, watching? * Rafael Landerreche is adviser to alternative education projects in Chenalhó. “14 families were displaced, a total of 81 people” reported Las Abejas of Acteal. Chiapas, Mexico. June 4. On 26th May, 81 people from 14 families from the Civil Society organization Las Abejas of Acteal, from the colonia Puebla, became displaced because “in this colonia great violence and shooting arose again at 1:45 pm,” the indigenous Tsotsiles from the municipality of Chenaló denounced in a communiqué. This latest displacement of families from colonia Puebla, is “by the political parties, through the dispute about power, in which 2 people died, 3 houses were burned, 2 destroyed, 3 vehicles wrecked and 6 people wounded,” Las Abejas communicate. “So far there are no suitable conditions for their return, because no final solution has been given,” they add. The violence in the community in Los Altos de Chiapas arose after the resignation of the mayor of Chenaló, Rosa Pérez, and the presentation of the new administration, headed by Miguel Sántiz Álvarez. The attacks have been made on the part of the followers of Pérez Pérez, the ex-mayor, who allegedly attacked supporters of Sántiz Alvarez, the new mayor, after his return from the inauguration, local media reported. The people of the colonia Puebla already went through a similar situation in August 2013, when they took refuge in the community of Acteal. At that time the displacement was also due to the climate of violence in the area. “As a result of the assaults, threats and harassment, 12 families (70 people), were forcibly displaced” the Fray Bartolome de las Casas Human Rights Centre reports. Women of Las Abejas de Acteal in their May monthly celebration. Photo: @Las Abejas de Acteal. As on each 22nd, Las Abejas of Acteal Civil Society Organization held its monthly celebration commemorating the Acteal massacre (1997). On this occasion, they recalled in a statement that, “18 years 5 months [have already passed] living the most difficult moments in our lives […] because there is no authority that cares about justice, that agrees with the rule of law”. They said that the discontent and protests that have taken place in recent months in Chiapas, in towns like Oxchuc, Simojovel and Chenalhó, “is not a true struggle to defend the rights of the people; it is only a struggle of political parties for the power and money of the town halls”. They also denounced that in “Chicomuselo transnational companies are offering people money to accept their projects”, where someone has already been killed due to this conflict. In addition, they mentioned several examples of injustice: the murder of Berta Caceres, the disappearance of the 43 students from Ayotzinapa, the repression of the Otomi people of San Francisco Xochicuautla and the Tlatlaya massacre. Following this, the statement noted that, “peace cannot be established while those above continue to promote violence. They just try to cheat the people with their strategies of giving crumbs while they have no will to resolve conflicts. They just impose their own decision to generate more violence and deaths.” Las Abejas of Acteal made a call for conflict resolution without resorting to violence from below, without political parties, through consistency, dialogue and mutual understanding, recalling the example of the struggle of Mahatma Gandhi. Finally, they added that “you cannot use the name of our organization, the photographs and logos to distort the meaning of our peaceful and active organization, but they do not stop deceiving” referring to the Consejo Pacifista Sembradores de la Paz (Sowers of Peace Pacifist Council). It should be recalled that the Consejo Pacifista appeared publicly in March 2015, disowning the Board of Directors as the governing body of Las Abejas but using the same stamp and logo of the organization. “Friendly fire” has created a conflict in the mountains of Chiapas which can only be viewed as lamentable. The Civil Society Organisation Las Abejas, founded in 1992, and an active proponent of the Catholic Theology of Liberation, has, since the historic exodus of the Tsotsil communities from Chenalho and the Acteal massacre in December 1997, been a point of reference for peace in the turbulent river of insurrection, resistance and autonomy which flowed forth from the mountains of Chiapas in January 1994. In October 2014, some members of the group, founded 28 years ago with the support of Bishop Samuel Ruiz Garcia, decided to split from Las Abejas and took the name “Consejo Pacifista Sembradores de la Paz” (the Pacifist Council of Sowers of Peace.) The key difference was that the second group wanted to change the strategy in respect of the demands for justice and reparations which Las Abejas have maintained since the terrible massacre they suffered 18 years ago. “Ever since that date they have carried out violent actions against members of our Organization and especially against the Board of Directors,” Las Abejas declared on April 20, 2016. It is not the first crisis of division the group Las Abejas has suffered. In 2008 a small group approached to negotiate with Juan Sabines, then governor of Chiapas, under cover of the PRD, when that cover already did not mean what it had done a decade before. At that time, the group tried to confuse the media and other organisations, but their own actions soon revealed their position. They kept the name “Las Abejas” but differentiated it. A while later, around 2011, unidentified plaintiffs, presumed to be victims of the massacre and members of Las Abejas, undertook a noisy lawsuit against ex-president Ernesto Zedillo for his role in the genocide that took place in Chenalho in 1997. They also demanded financial compensation. The ambiguity of the process, which Las Abejas opportunely set itself apart from, culminated in something worse than a defeat: the confirmation of unrestricted impunity for former Mexican rulers at an international level. The rift with the Consejo Pacifista, with all its peculiarities, has been less clear due to bold acts of identity theft, like stealing Las Abejas’ official seals [stamps] and contending for control of the space known as the “Sacred Ground” in the hollow of Acteal, Chenalho, which is where the massacre took place and where the victims are buried. This land is also the headquarters of [Las Abejas,] an independent and active organisation which has never relented in its resistance, its nonviolent response, nor in its demands for justice and reparations (in this order and not in reverse). It has never proposed that negotiation for economic resources or compensation or “support” should have precedence over its main demands; it is more that the lies and impunity of the state continue to taunt these Tsotsil Pedranos who were massacred by a government which was just as strongly a member of the PRI as the current one. According to information from the weekly magazine Proceso, members of the current Consejo Pacifista were among those who launched the case against Zedillo in the United States, although Consejo Pacifista deny this. Another indication of this breakdown in relations between Consejo Pacifista and Las Abejas is a hostility towards those who have provided legal support and disseminated information for Las Abejas since its foundation. The Fray Bartolomé de las Casas Human Rights Centre (Frayba) and its president, Bishop Raul Vera Lopez, were sued in court by Consejo Pacifista and although the previously unheard of case was not substantiated, it left a painful precedent. Frayba considers it “risky” in that it opens a new flank in the incessant siege that centres like Frayba and organisations like Las Abejas suffer as targets of the everyday low intensity war which never ends in the mountains of Chiapas. From this a war of words has followed aimed at “discrediting” this work. Frayba insists that the Consejo Pacifista “wages a smear campaign that seeks to delegitimatise the process of autonomy of Las Abejas of Acteal” and that none of this is about denial of information or discriminatory treatment. The meetings, Frayba added, “had an end goal that through dialogue the distinct parties would resolve the problems highlighted by the now members of Consejo Pacifista.” The invitation to Frayba was to act as an observer, not a mediator. The Board of Directors, along with representatives and coordinators of Las Abejas of Acteal, listened to the Consejo Pacifista people. When it was the time for the authorities of Las Abejas of Acteal to speak, the Consejo Pacifista members “refused to listen, suggested they would leave the organisation and declared the dialogue finished”. Nonetheless, Frayba “encouraged all parties to continue the dialogue”, but without success. The document stresses that “the historic and legitimate spokesperson” that the body accompanies in the Acteal massacre case before the IACHR is the Civil Society Organisation Las Abejas of Acteal “through their only authority, the Board of Directors, the body of legitimate leadership as chosen by the communities of the organization, as well as by the survivors of the Acteal massacre who continue to recognise the Board of Directors as their representatives, as established by their own rules and procedures”. In June, members of the Consejo Pacifista and their legal representative Arturo Ricardo Lagunes Gasca filed a complaint via federal government agencies against Vera Lopez, in his role as president of the human rights centre. The Second District Court of Chiapas was presented with a suit for amparo “pointing to Frayba as the responsible authority” and insisting that the cited documentation be handed over, “which it affirms is currently with the IACHR”. As they also made allegations of “discrimination and denial of the right to information,” Vera Lopez, Frayba’s Board and director “were required to answer with a detailed report as if we were a federal agency.” On 25th January 2016 the same request and terms were made to the Board of Directors of Las Abejas of Acteal. The Consejo Pacifista and their legal representative likewise asked the IACHR “to join as co-petitioners the case 12.790, and for a copy of the dossier.” On 10 December 2015 the IACHR announced they were accepting new co-petitioners, and, “in this way the Consejo Pacifista got a copy of the case they had requested from Frayba and as they had at one time done [requested] from Las Abejas of Acteal”. On March 16, the Pacifist Council’s suit for amparo was thrown out, because Frayba “is not a responsible authority.” Nor was it accepted that it had denied the right to information or committed any discrimination. In April, Las Abejas denounced the Consejo Pacifista as behaving in ways “contrary to the pacifist, autonomous and non-partisan spirit that they profess.” Further “they have a double standard: in public they speak of conciliation and peace and say that they want dialogue, but this is not true because they act threateningly and with hostility,” because “they want to take over the physical and symbolic spaces of our organisation in Acteal, the House of Memory and Hope”.